Welcome to our guide to growing air plants including how to care, water and use them for decorating around the house. Air plants are easy to love. They clear the air, add a bit of nature to your space and never fail to impress with its lush green appearance. They not just get freshness into a space but also add to the décor of the room. While a lot of people aspire to have these beauties in their homes, it requires the right kind of care to grow them. Nicknamed ‘Air Plants’, the real name of the plant is Tillandsia. 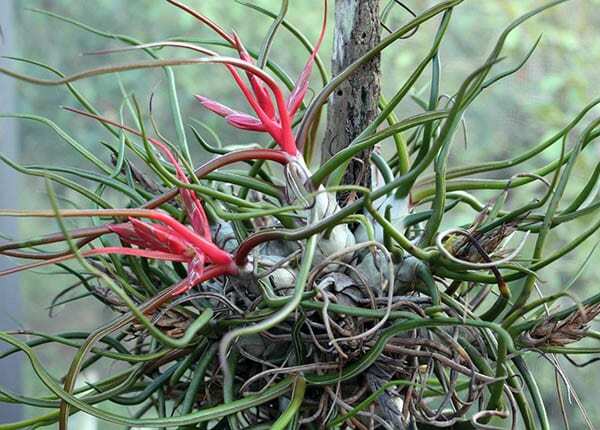 With so much hybridization, Tillandsia’s come in a wide variety. Air Plants are special since they do not grow their roots into the soil, but instead as their name suggests, obtain nutrients from the air using their leaves. What makes them prominent among home décor lovers is their distinct look. Tilly’s as their lovingly called are low maintenance plants and are hence preferred widely. They require considerably lesser water and love light, making them the coolest plant you can bring indoors. Air Plants look quite similar yet carry some striking distinct features. When you are looking out to choose the right Air plant for your home, you need to consider various factors such as the availability of light and water. Though Air Plants are generally called by their scientific name Tillandsia, they can be varying in terms of sizes, colors, flowers and fragrance. The popular Tillandsia Lorentziana which is native to Brazil and Bolivia, has white leaves that are soft and velvety to touch. 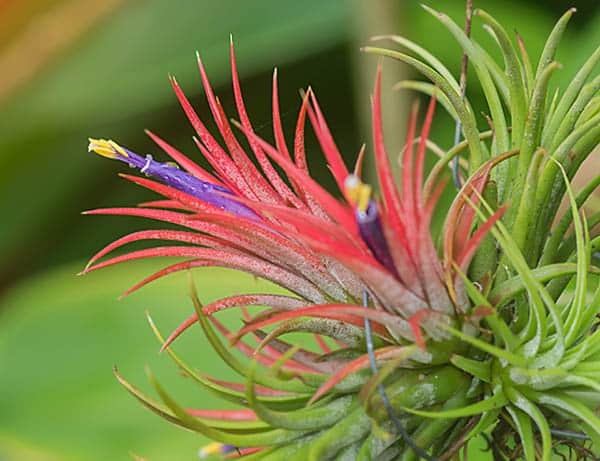 The Tillandsia tricolor has a colorful look to offer. With bright green leaves which darkens towards the base, it has tints of red that makes it really stand out. The Tillandsia Houston is a drought tolerant type of Air Plant so if you live in places with dry climatic conditions, this is the one to choose. 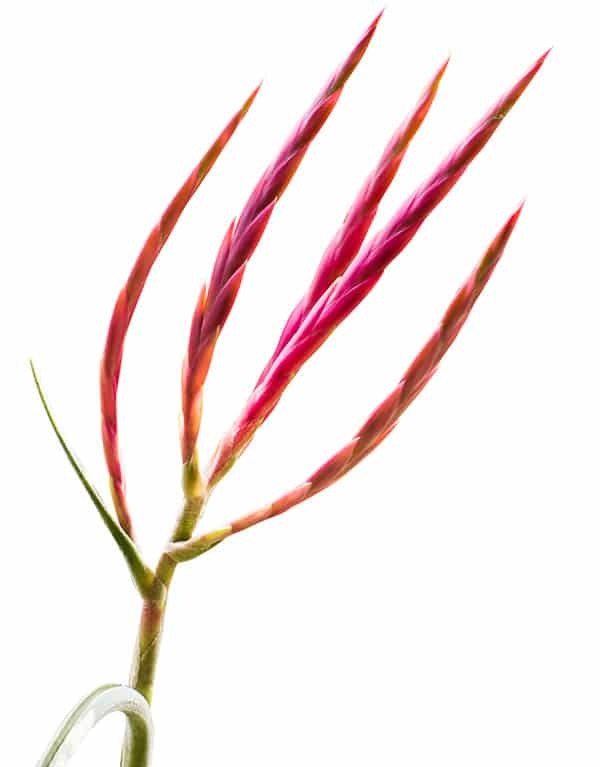 The Tillandsia Abdita is a beautiful Air Plant with leaves that turn from green to a striking red when its flowers bloom. If you like Air Plants that grow in clumps, then the Tillandsia Bergeri is the right choice. They look best when suspended freely so that they can happily clump and bloom. Air Plants are perfect for those who find growing indoor plants too much to commit to. 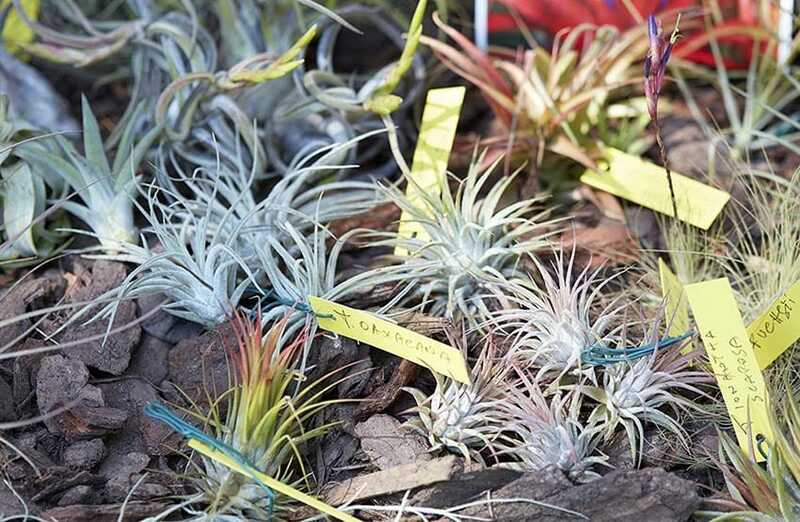 With more than 650 varieties of Air Plants, they are popular choices for homes. They only use their roots to attach themselves to rocks, concretes, trees, shrubs etc and absorb essential nutrients from the air. Though Air Plants require very less maintenance, there are certain important rules to follow while growing Air Plants at home. The first rule for growing air plants is having good air circulation. Don’t expect the Air Plant to be its happy self if it doesn’t breathe enough with good air and space. Knowing when to water your Air plants is quite an important point to know while growing these indoors. 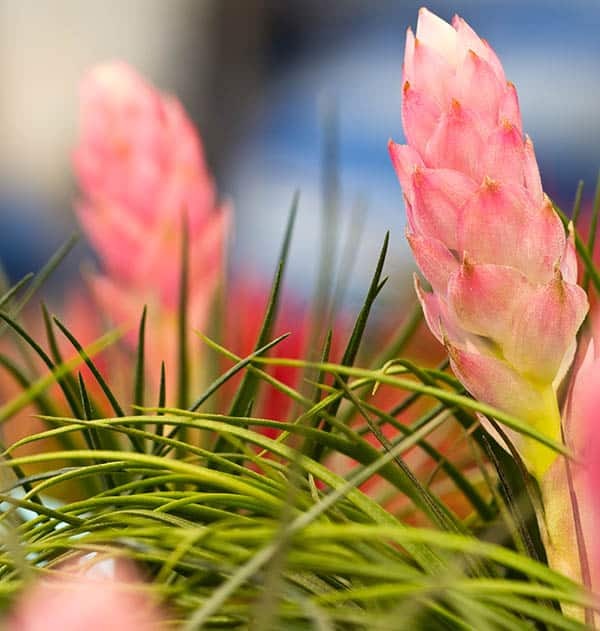 Also, for healthy growth fertilize the Air Plants with low-nitrogen fertilizer mixes that are not too strong. Air Plants are used to having a sunny environment, so don’t keep them in a place where the temperature is low. Neglecting these key Air Plant growth essential points might be harmful for your plants. Air Plants bloom when they are fully matured and this happens only once in their lifetime. So if you are mindful enough of giving them the right care, you can see your Tillies blooming and producing beautifully colored flowers. Flowers tend to remain for months together depending on the species. At this time, the mother Tilly gives birth to baby Tillies (pups) and eventually withers off. You can then see the entire lifecycle of the Air Plants through the younger Air Plants. The entire process takes up quite a lot of time but its worth caring for these pretty greenies to see how they grow and wither giving rise to new ones. Air Plants have various native set ups to thrive. From tropical rainforests to open woodlands and even deserts, Air Plants hold on to surfaces like rocks, rooftops, branches etc to grow. Like every other type of plants, Air Plants too have roots, leaves and flowers. However, their roots act as anchors and the leaves take up the task of absorbing moisture from the air. If you are planning to buy yourself some Air Plants, then ensure you know well about caring for them. Although they are low maintenance plants, Tilly’s need a good amount of sunlight and appropriate moisture. In a home environment, keeping your Air Plants near the window to bathe them in filtered sunlight is a good way of caring for Air Plants. Rooms that have southern or eastern facing windows are ideal picks to place your Air Plants in, since these rooms will be flooded with natural light almost throughout the day. The more sunlight it receives the happier it grows and also would require more moisture for survival. A lot of people place Air Plants in the bathroom to keep them in a humid space. But while doing so, Air Plants may lose out on the necessary sunlight which effects their growth. But if bath spaces are sunny enough then it would be a perfect set up for an Air Plant. While Air Plants kept outdoors on the porch or by the pool get the best of both, indoor plants need a little bit more attention. Watering Air Plants can be quite tricky. You don’t want to under water them nor over water. A lot of home owners don’t provide enough water to Air Plants thinking they are low maintenance and that they absorb moisture from the air. This is clearly a wrong notion. Plants in tropical rainforest set up can thrive with the moisture in the air but for home set ups, where the air is generally dry its best to manually water them. Misting them is not a great option, since it can only make the surrounding humid but not give them enough water to survive. The best way of watering Air Plants is by immersing them in a dish of water for 12hours and then shaking it off well before placing them back in their spot. Air Plants take in only as much water as they require so you won’t be over watering them in this method. After watering them, they wouldn’t require water for the coming two weeks but its best to observe your plants carefully each day to know what suits them the best. Pay attention to how they look a day after they are watered; see what color the leaves are and how healthy it looks. Over the days when the water gets used up, see how the leaves start to look. The ends might turn brown and the leaves might curl due to lack of water. This way, while observing your Air Plants you will get a good understanding of how often it requires water. Also, when the Air Plants have bloomed, do not submerge the flowers into the water. Since the petals are very delicate, you can mist them lightly to keep it fresh. If you come across a dull and wilting Air Plant that you want to get home, chances are it needs a good bath to get it back into good shape. All you need to do is submerge it in water for a good amount of time and keep it in a sunny place while enjoying its beauty. Soon you will find it gaining its color and health back. If you find your Air Plants turning brown, it means you need to pay more attention to the water that you are using to bathe it. Chlorinated or harsh water is not suitable for Air Plants which may turn off its bright green shade and make it brownish. In such situations, treat your Air Plants to rainwater or unchlorinated water with an overnight bath to get it back into shape. Air Plants are gorgeous and have their own charm when placed in a room. 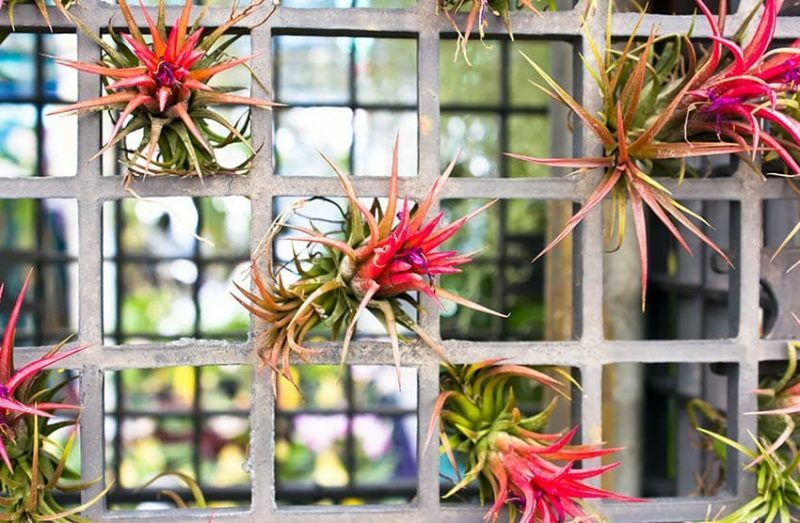 From their freshness to their attractive appearance, Air Plants are just perfect as decorative elements in a home. Unlike other indoor plants that require a good spot and soil and regular watering, Air Plants are easy to grow and maintain. They are versatile and can be kept in a variety of set ups to add to the décor of your space. You can place them in fancy planters or even suspend them in glass forms to add an upscale architectural element to your space. 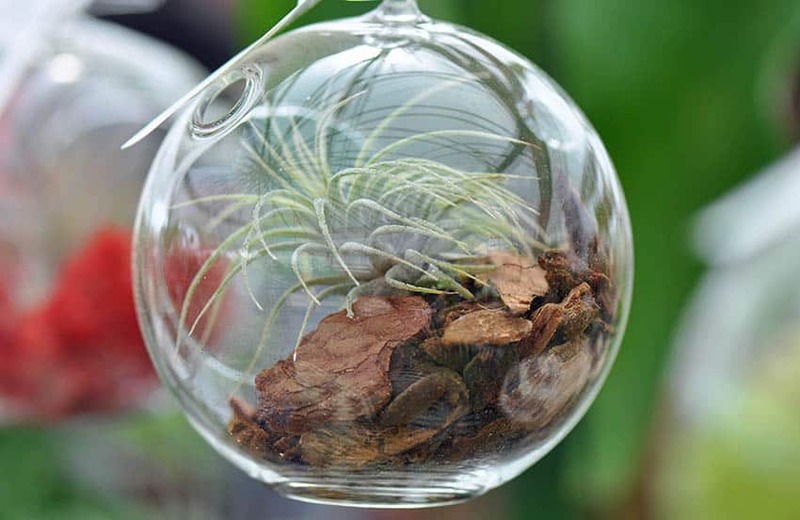 The best part is, Air Plants can be used as decorative pieces without much hassle. No need to watch out for the soil or worry about watering them, you can just place them in the planters of your choice and let them strike a statement. A Tillandsia air plant kit can be found online or at many local garden centers. The plants from these kits can be placed in terrariums, hanging planters or decorative holders making them ideal for almost any room in the house. Air plants can be placed on your dining table, on your study table, on the coffee table or just lined up against the window basking in the sun. Always keep them clustered together to bring in some extra drama to your space. You can also keep them in other decorative elements like vintage bird cages or pull out drawers. Have a favorite antique in mind? Accentuate it by pairing it with an Air Plant and create some visual interest with these pretties. 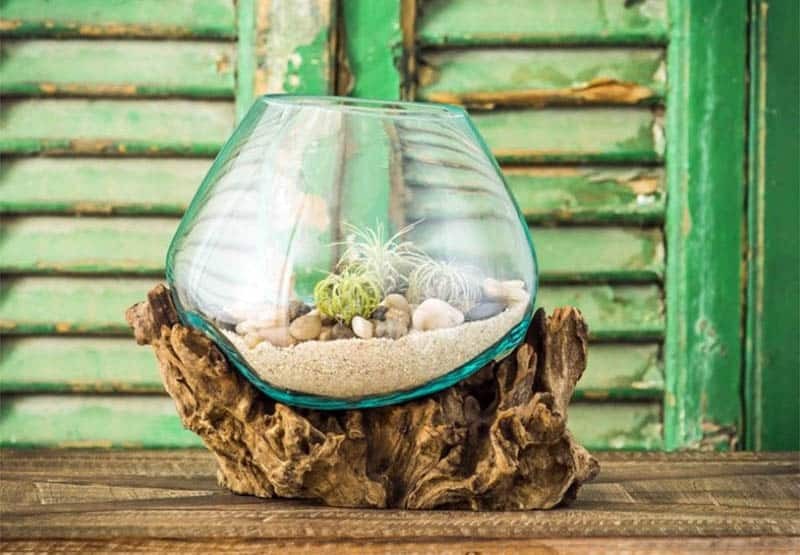 One of the most popular ways of using Air Plants as décor pieces is growing them in terrariums. These little glass gardens within your house instantly bring indoors the goodness of nature while being super chic décor elements.